The Food Pantry provides food for families in need. 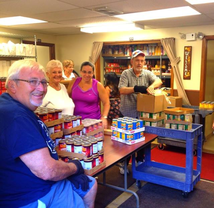 Church of the Holy Spirit's Food Pantry has been in existence since October, 2004. We are a non-geographic, non-denominational food pantry and will help any family who needs our assistance. The hours of operation are from 2:00 PM - 5:00 PM., on Thursdays. It may be used once a month by each family. Picture identification is required for each visit. The Food Pantry is located in the lower level of the Kane Center. The entrance is between the Kane Center and the garages. The Food Pantry is staffed by volunteers and help is needed during pantry hours. We are always looking for volunteers to serve guests, stock shelves and other tasks as needed. Volunteers are also needed on Wednesday mornings between 11:00 AM and 1:30 PM and Thursday mornings between 9:30 AM and 11:30 AM to help unload and store the food deliveries from the Greater Chicago Food Depository. For more information please contact LaVerne Horgan at (224) 813-0070. Volunteers Make The World Go Round!!! Our Food Pantry volunteers spend many hours every week sorting, packing, cleaning, repairing, etc., to serve an average of 400 families per month. We are so blessed by their presence!